APPLE’s latest hot ticket seems to be a tad too hot to hold, some users are reporting. New iPad owners on the MacRumors forums and Apple’s own support community complain that the slab’s lower left corner can get a little warm during extended use. Don’t get excited though, reports seem to vary by user — some are reporting that their tablet becomes too uncomfortable to hold while others say that it only gets “slightly warm” and that it’s “expected.” How’s your new iPad treating you? Click on through to the comments and let us know. TODAY Apple (NASDAQ:AAPL) announced it has sold three million of its new iPad, since its launch on Friday, March 16. The new iPad features a stunning new Retina display, Apple’s new A5X chip with quad-core graphics, a 5 megapixel iSight camera with advanced optics for capturing amazing photos and 1080p HD video, and still delivers the same all-day 10 hour battery life while remaining amazingly thin and light. iPad Wi-Fi + 4G supports ultrafast 4G LTE networks. KICKSTARTER is the world’s largest funding platform for various types of projects. Every week, tens of thousands of amazing, creative people pledge millions of dollars to projects from the worlds of music, film, art, technology, design, food, publishing and other creative fields. Something that is different about Kickstarter is that it is not about investment or lending. Project creators keep 100% ownership and control over their work. Instead, they offer products and experiences that are unique to each project. Another interesting part of Kickstarter is, on Kickstarter, a project must reach its funding goal before time runs out or no money changes hands at all. You may ask why, their answer is so that it protects everyone involved. Creators aren’t expected to develop their project without necessary funds, and it allows anyone to test concepts without risk. If you would like to help some inventors with as large or small of a donation as you wish. Or if you have your own genius idea that you might need some funding for, visit Kickstarter. IF you would like to watch the keynote release of the new iPad/March 7th presentation you can go to the link below. TWO months ago, Google announced their plans to roll out a new design for the Google bar. 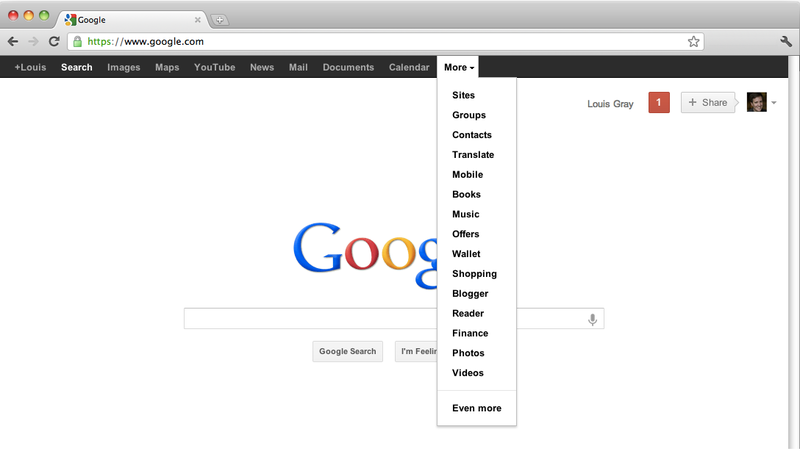 The goal was to create a beautiful, simpler and intuitive experience across Google. Based on user feedback, they realized there were some elements of the new bar that we could improve, and with that in mind, we’re introducing an updated version that we believe will provide a better experience. The new design retains many of the feature changes we made in November that proved popular, including a unified search box and Google+ sharing and notifications across Google. The biggest change is that the replaced the drop-down Google menu with a consistent and expanded set of links running across the top of the page. THE people over at LogMeIn have recently release a free iOS application. The application was launched Dec. 22. For those of you who don’t know, LogMeIn is a service where you can remote access your computer(s). Personally I use it all the time and it is a lifesaver. You can also learn more by going to their website. Anyway, for a long time they have not had a free iPhone/iPad application. They finally released one. So now, from your iPhone or iPad access the computers you have set up on LogMeIn. To view more information about the app, just search for it in the App store or visit the link below. THIS is a press release from Apple earlier today. SAO PAULO, Brazil—December 13, 2011—Apple® today announced the launch of the iTunes Store® in Brazil (www.itunes.com/brazil) with an incredible selection of Brazilian and international music from all the major labels and thousands of independent labels. Launching with a catalog of over 20 million songs, the iTunes Store in Brazil features local artists including Ivete Sangalo, Marisa Monte and the digital debut of Roberto Carlos’ catalog, available to purchase and download along with a wide range of international artists including the Beatles, Rihanna, Coldplay and thousands more. With most songs priced at 99 cents and most albums at $9.99, the iTunes Store in Brazil is the best way for iPad®, iPhone®, iPod®, Mac® and PC users to legally discover, purchase and download music online. The iTunes Store in Brazil offers over a thousand movies to rent or purchase, with many in stunning HD, from major studios including 20th Century Fox, Paramount Pictures, Sony Pictures Home Entertainment, Universal Pictures, The Walt Disney Studios and Warner Bros. Pictures. The iTunes Store in Brazil now joins the revolutionary App Store™, which offers more than 500,000 apps to consumers in 123 countries, reaching hundreds of millions of iPad, iPhone and iPod touch® users around the world. Customers have downloaded more than 18 billion apps to date. Apple is also bringing the iTunes Store to 15 additional Latin American countries including Argentina, Bolivia, Chile, Colombia, Costa Rica, Dominican Republic, Ecuador, El Salvador, Guatemala, Honduras, Nicaragua, Panama, Paraguay, Peru and Venezuela. The iTunes Store in Brazil and Latin America offer music from major labels EMI Music, Sony Music Entertainment, Universal Music Group and Warner Music, and thousands of independent labels. All music on iTunes® comes in iTunes Plus®, Apple’s DRM-free format with high-quality 256 kbps AAC encoding for audio quality virtually indistinguishable from the original recordings. iTunes in the Cloud lets you download your previously purchased iTunes music to all your iOS devices at no additional cost, and new music purchases can be downloaded automatically to all your devices. In addition, music not purchased from iTunes can gain the same benefits by using iTunes Match℠, a new service that upgrades your music to iTunes Plus when matched to the over 20 million songs in the iTunes Store catalog. iTunes in the Cloud is available today for free in Brazil and Latin America and iTunes Match is available today for a $24.99 annual fee in Brazil. Congratulations to Apple. I hope that this store and this launch is beneficial to both Apple, and more importantly its users, in the newly launched countries. New York City just got a stunning new tourist attraction. Apple’s largest-ever retail venue opened on Friday at the historic Grand Central Terminal in Manhattan. Swarms of fans camped out for hours to be among the first to enter. At 10am this morning, the 23,000 square foot Grand Central Terminal store finally opened doors for business and big crowds filled the concourse of the Terminal ahead of grand opening. Apple is handing out 4,000 black T-shirts with “Apple Store, Grand Central” graphic resembling a train arrival board, similar to that used as a blockade prior to the opening. New York’s Metropolitan Transit Authority will rake in over $1 million per year as a result of the Apple’s lease on the terminal’s balcony space, although some have pointed out that Apple may have signed on for a sweeter deal than other Grand Central tenants. Writes CBS New York, the MTA “collects ‘percentage rent’ from every retailer except Apple. That is because the retailer cut a deal with the MTA for a straight lease, totaling about $1 million a year.” New York’s Committee on Corporations, Authorities and Commissions is currently investigating the 10-year agreement between Apple and the MTA, according to Pix 11. The store is Apple’s fifth location in Manhattan. Take a look at the slideshow (below) to see photos from the new Grand Central Apple Store. NEW YORK—December 7, 2011—The Apple Store® Grand Central, Apple’s fifth store in Manhattan, will open Friday, December 9, at 10 a.m., just in time for the holidays. This one-of-a-kind Apple retail store overlooks the historic Main Concourse from the East and North East balconies of the world-famous Grand Central Terminal, and has two Genius Bars for free tech support and advice. Convenient services at the Apple Store Grand Central include Personal Pickup, a feature of the free Apple Store App which lets iPhone® users shop and buy from anywhere they are, then pick up their purchase when they reach the terminal. Customers using the Apple Store App can even scan and pay for accessories with their iPhone using the new EasyPay function. And new 15-minute Express Workshops offer tips and tricks in a streamlined format to serve customers on a tight schedule. The store’s expert team has 315 passionate employees who deliver these and other amazing services, which have become the hallmark of Apple retail stores worldwide. Beyond the balcony overlooking the expansive Main Concourse, the Apple Store Grand Central offers rooms dedicated to some of our most popular services, including the largest area in the world dedicated to Personal Setup. In the Personal Setup room, customers who buy an iPad®, iPhone, iPod® or Mac® can get up and running before they leave the store. There’s also a room designed especially for Personal Training, where new Mac owners learn the basics or take their skills to the next level as part of Apple’s popular $99 One to One program. Holiday shoppers in Manhattan now have five unique Apple stores to choose from, each perfectly suited to the neighborhoods they serve: Fifth Avenue, Upper West Side, SoHo, West 14th Street and Grand Central. Around the world, nearly 300 million people have visited Apple retail stores in the past 12 months. There are 361 Apple stores in eleven countries including the US, UK, France, Germany, Spain, Switzerland, Italy, Japan, China, Australia and Canada. The Apple Store Grand Central is open from 7 a.m. to 9 p.m., Monday through Friday, Saturday 10 a.m. to 7 p.m., and Sunday 11 a.m. to 6 p.m.
FACEBOOK is ramping up security by giving people the option of setting passwords for games or other third-party applications added to pages at the leading online social network. Facebook said Thursday that “App Passwords,” along with a forgotten password recovery feature called “Trusted Friends,” will be added in the coming days to safeguards at the service used by about 800 million people worldwide. “There are tons of applications you can use by logging in with your Facebook credentials,” the California-based firm said in an online post. Users will be able to set passwords for applications by going to a security section in account settings. The Trusted Friends feature will let Facebook members pick three to five people who will serve as touch points if main account passwords are forgotten. “We’ll send codes to the friends you have selected, then you can log back into your account using these codes after your friends have passed them along to you,” Facebook said. CUPERTINO, California—October 17, 2011— Apple® today announced it has sold over four million of its new iPhone® 4S, just three days after its launch on October 14. In addition, more than 25 million customers are already using iOS 5, the world’s most advanced mobile operating system, in the first five days of its release, and more than 20 million customers have signed up for iCloud®, a breakthrough set of free cloud services that automatically and wirelessly store your content in iCloud and push it to all your devices. iPhone 4S is available today in the US, Australia, Canada, France, Germany, Japan and the UK, and will be available in 22 more countries on October 28 and more than 70 countries by the end of the year. iPhone 4S is the most amazing iPhone yet, packed with incredible new features including Apple’s dual-core A5 chip for blazing fast performance and stunning graphics; an all new camera with advanced optics; full 1080p HD resolution video recording; and Siri™, an intelligent assistant that helps you get things done just by asking. So as you can tell Apple’s new iPhone sales are doing very well. Certainly a lot better than I thought it would be. APPLE has released a new version of their famous iPod Nano. It comes with some unique features. Clock Faces– This allows you to use an iPod Nano wristband and then set one of many clock faces to your iPod to use it as a watch. Apple has come up with over 15 different types of appearances so that it is sure that you will find one that fits you and your style. Fitness- The iPod Nano is great for working out. With the iPod Nano, it has a built-in accelerometer which allows you to keep track of your exercise with Nike integrated. FM Radio- This makes it very easy to tune right into your favorite FM Radio station, right from your iPod. The iPod also has multi-touch, which makes it enables it to do so much more. APPLE came out with a new iPod Touch a few days ago. The new iPod Touch (5th Generation) has shockingly only a few new features that they added. Apple has added the iPod Touch in a White colour. It is the same as the iPhone. It also has better video recording and picture taking, which allows you to get the best shot each and every time. With built-in editing, it allows you to edit your photos and video clips while you are on the run, or as a great mobile tool. TODAY Apple released some new products. The iPhone 4S, is one of many. The new iPhone (4S) has some brand new features that I will be telling you about. One of the newest of the new features of the iPhone 4S is a feature called ‘Siri’. With this new Siri feature you can actually tell your phone what to do. The technology behind Siri allows for you to just tell/ ask it something and it will interpret and perform the action, literally making your wish, its command. With Siri, you can talk to it like you would a normal person. The program not only understands what you say, it is also smart enough to know what you mean. So when you ask something such as: “Any good burger joints around here?” Siri will reply “I found a number of burger restaurants near you.” Then you can say “Hmm. How about tacos?” Siri remembers that you just asked about restaurants, so it will look for Mexican restaurants in the neighborhood. Siri is not only good for finding things, but it can also do things such as reply to text messages, add calendar events, and so much more. In order for Apple to help make your experience better, they have added the new ‘A5’ chip. This is supposedly going to make the phone about 2 1/2 times faster. It will help with both game play, and web streaming. In the A5 chip, there are two cores. The new camera that is on the iPhone 4S has added a 5th lens to the camera. Also it has a much better picture. You now have 8 megapixels, and a much larger 2.4 aperture. It also takes amazing pictures. Also they have made the new video camera much better. The camera shoots 1080p video quality. It also adds very high quality video stabilization. For both pictures and video, you have video editing tools. The new phone will also have the latest of Apple’s mobile operating systems installed on it. I have touched on this a lot before, so there is not too much else to report. Just as a reminder, iOS 5 has: Reminders, Notification Center, iMessage, Twitter Integration, NewsStand, PC Free and More! The iPhone 4S is the first phone to intelligently switch between two antennas to transmit and receive, so call quality is better. It also doubles the maximum HSDPA data speeds to 14.4 Mbps, this means faster connections, faster loading and reloading, and faster downloads.